Sunday Sequels is one of my newest memes. Every Sunday, I'll post covers, news, or other stuff about sequels in a popular series. 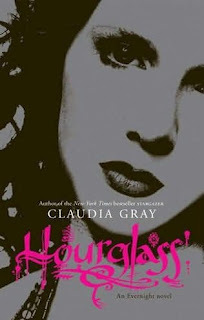 This week, I'm going to talk about Hourglass, the next book in the Evernight series by Claudia Gray. Yes, it's another vampire series, but I really enjoy it. Soon, Bianca and Lucas are on the run again, pursued not only by Black Cross, but by the powerful leaders of Evernight. Yet no matter how far they travel, Bianca can't escape her destiny. Bianca has always believed their love could survive anything . . . but can it survive what's to come?